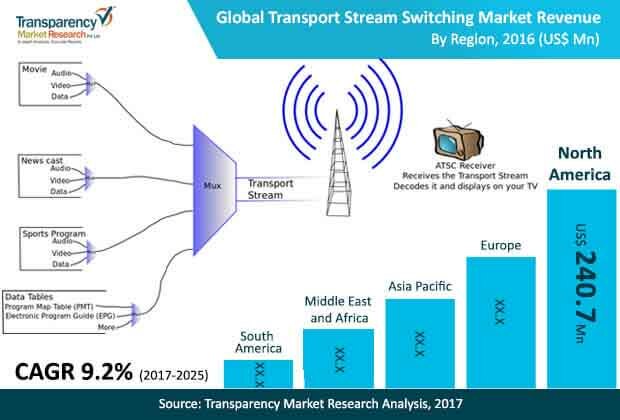 The global transport stream switching market is anticipated to grow at a CAGR of 9.2 % during the forecast period 2017 to 2025, majorly due to increase in adoption of live streaming and video on demand services in developing geographies such as Asia Pacific and Middle East & Africa. Increasing adoption of digital advertisement is anticipated to fuel the growth of the global transport stream switching market during the forecast period. The Transport Stream Switching services market has been segmented on the basis of components, streaming type, end use and geography. On the basis of components, the market is segmented as software and services. In 2016, services dominated the global market in terms of revenue. The primary reasons being the rising demand for integration of transport stream switching software with existing hardware and to procure appropriate software based on application requirements of the end user. The global transport stream switching software is further classified into transport stream processing, transport stream splicing, regional television, content replacement or blackout, ad insertion (Ai) (Dynamic Ad insertion), logo insertion, audio/subtitle insertion, and channel in a box. Similarly, transport stream switching services are further segmented into consulting, system integration, and maintenance. Among the software segment, transport stream processing held the largest share in 2016 and is anticipated to grow at a decent growth rate during the forecast period. The channel in a box and ad insertion segments are anticipated to grow at prominent growth rate during the forecast period and are anticipated to contribute approximately 27% by 2025. Amongst the services segment, consulting services are expected to view a decent growth, growing at a CAGR of 9.5% during the forecast period 2017 to 2025 and contribute largest share towards the global transport stream switching market. Based on streaming type, the transport stream switching market is segmented into live streaming, linear TV, and video on demand streaming. Video on demand streaming segment contributed maximum market share towards the global transport stream switching market in 2016 and is expected to grow at healthy CAGR during the forecast period 2017 – 2025 owing to increasing preference over linear television. The end use segment of global transport stream switching market is categorized as broadcasters and operators, BFSI, education, healthcare and others. In 2016, broadcasters and operators segment contributed the largest market share in the global transport stream switching market. Furthermore, the broadcasters and operators end use segment was followed by education and BFSI segments. In 2016, collectively, education and healthcare segments contributed approximately 37% to the global transport stream switching market. Based on geography, the global transport stream switching market is segmented into North America, Europe, Asia Pacific, Middle East and Africa, and South America. The global transport stream switching market is expected to grow at a prominent CAGR in the Asia Pacific and Middle East and Africa regions. However, North America and Europe are anticipated to be the dominant markets for transport stream switching in terms of revenue throughout the forecast period. Some of the key players engaged in Transport Stream Switching market are, Starfish Technologies Ltd, Mediaware International Pty Ltd, Manzanita Systems, Harmonic, Inc., VBrick Systems, Inc., MIVIDI, Techex, AdGorilla LLC, Telestream, LLC, Nevion AS, ROHDE&SCHWARZ, and nablet GmbH. The report provides an in-depth analysis about the strategic business activities along with the market dynamics shaping the global aircraft brake system market over the period of study. The report provides an in-depth analysis of the global transport stream switching market for the period from 2015 to 2025, wherein the period from 2017 to 2025 comprises the forecast period and, 2016 is the base year. Data for 2015 is provided as historical information. The report covers all the major trends and technologies playing a major role in the growth of the transport stream switching market over the forecast period. It also highlights various drivers, restraints, and opportunities expected to influence the market’s growth during the said period. The study provides holistic perspective on the market’s growth in terms of revenue in US$ Mn, across different geographical regions namely North America, Europe, Asia Pacific, Middle East & Africa, and South America. Global transport stream switching market is experiencing decent growth owing to the increasing adoption of live streaming and video on demand services in developing economies such as Asia Pacific and Middle East & Africa. Furthermore, increasing adoption of digital advertisement is anticipated to fuel the growth of the global transport stream switching market during the forecast period. One of the major factors responsible for the growth of the transport stream switching market is the increasing adoption of optimized video codecs for broadcasting at improved quality and reduced bitrates which is expected to supplement the growth of transport stream switching market during the forecast period. The market overview section of the report showcases the market dynamics namely drivers, restraints, and opportunities that influence the current nature and future status of this market. Furthermore, it also includes trend which can help to drive the market in future. The report also provides the ecosystem analysis and key market indicators for the transport stream switching market. The data estimates are the result of our in-depth secondary research, primary interviews and in-house expert panel reviews. These market estimates have been analyzed by taking into account the impact of different political, social, economic, technological, and legal factors along with the current market dynamics affecting the market growth. Transport stream switching market is segmented by components, streaming type, end use and region. Based on component, global transport stream switching market is categorized into software and services. Among these components, software is further segmented into transport stream processing, transport stream splicing, regional television, content replacement or blackout, ad insertion (Ai) (Dynamic Ad insertion), logo insertion, audio/subtitle insertion, and channel in a box. The services segment is further classified into consulting, system integration, and maintenance. On the basis of streaming type, global transport stream switching market is sub segmented into live streaming, linear TV and video on demand streaming. Based on end use, transport stream switching market is segmented into broadcasters and operators, BFSI, education, healthcare and others. The report also includes competitive profiling of the key players associated with the transport stream switching market around the globe. The company profile includes business strategies adopted by these companies, market positioning, financials, SWOT analysis, and recent developments. Competitive landscape section of the report also gives an overview about the major contributing regions/countries by these key players in order to strengthen their market position in the future. The report also include competition matrix for players that are identified to be playing prominent role in the global market.